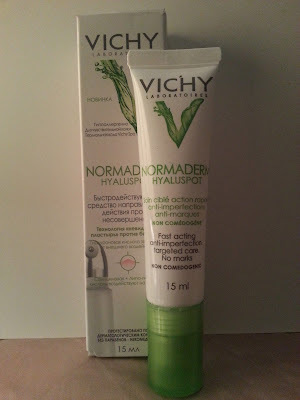 I've have a bad history (read: one product) with the Normaderm range as it's not exactly tailored for my skin. The products treat blemishes and imperfection are suitable for sensitive skin, but they are for the more oily skin types. Like La Roche-Posay's Effaclar range. But as I've said before (in the Effaclar Duo vs AI post) I find targeted treatments to be far more beneficial anyway. Minimal effects on healthy skin and maximum impact on the problem area. In this way, when going for a product from this range, I have to be for focused and go for the more targeted products. That's where Hyaluspot comes in. I have to say the press release for this was terrifying. Talking about the amount of bacteria there is on things we touch every day and how often we touch our faces. It's a scary amount! Blemishes occur for three reasons, sometimes a combination of all three. Hormones, oil and bacteria. Well there's little we can do to sort out our hormones, thanks nature, but Hyaluspot takes care of the rest. Firstly it's anti-bacterial, so it stops the nastiness from getting any worse. Next, it has salicylic acid (which fun fact comes from the bark of the willow tree, it's found in aspirin) which is great for breaking down oil plugs *gross* that block our pores and cause blemishes. It's a great pore cleanser all round, and found in a lot of general acne and blemish treatments. But what I love about Hyaluspot the most is that it contains hyaluronic acid. That wonderful wonder ingredient that occurs naturally in skin and holds 10 times it's weight in water. So why is that so great? Well it means, unlike other blemish treatments, it's hydrating the area it's applied to while it's treating it - unlike pretty much every other treatment that dried out the area. Genius? Well I think it is. 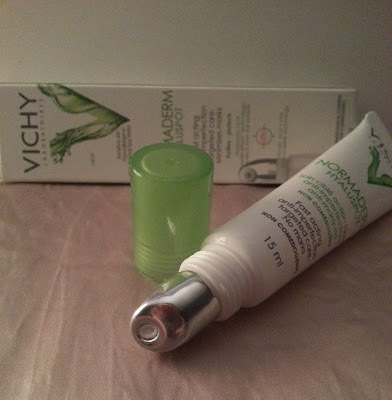 The gel settles to form what Vichy are calling a "bandage" over the blemish. Keeping air and bacteria off it. All well and good, and they say you can apply makeup over it - but I do say apply with caution. If you rub at it the gel will come away - and look a little like your skin is peeling for a second. What I found is if I carefully stipple foundation or concealer in the area then it's perfect - and great to know it's still treating as I go about my day. And does it work? Definitely, and very quickly too. Case and point - I woke up with four little spots on my right cheek. By the end of the day they were reduced to smaller red bumps. Next day, smaller red marks and by tomorrow I'd say they'd be gone completely. This has been the case for every blemish I've treated since I got Hyaluspot. And all the while they've been very easy to conceal and cover them during the healing process. I also find that I get fewer recurring breakouts in the same area. Win, win! Vichy Normaderm Hyaluspot costs all of €10 and is available now! Do you think you'd give it a try?